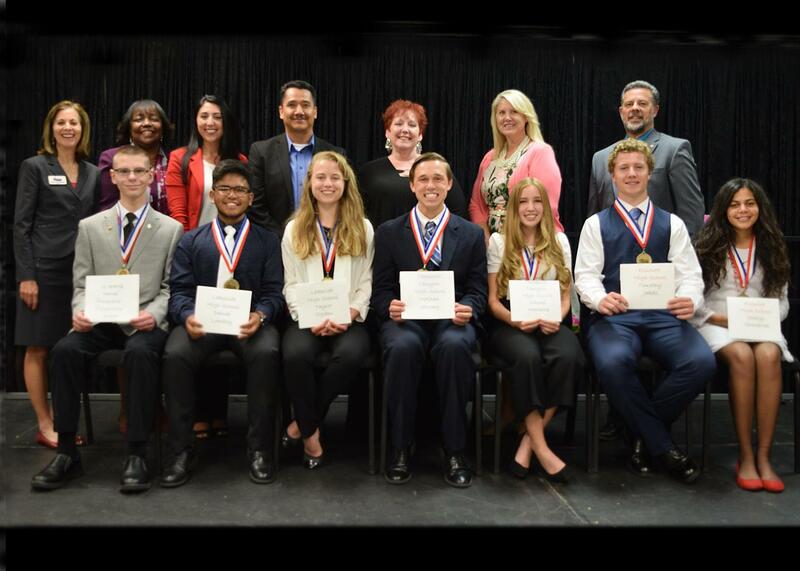 Recognizing LEUSD students since 1996! APRIL STUDENT OF THE MONTH: L-R front: Alexandra Ackerman—EHS; Samantha White—LHS; Kortney Turner—TCHS. Standing: Cody Brown—EHS; Christian Lezama Mora—LHS; Travis Bourdon—TCHS; Dylan Ivan—KMA. 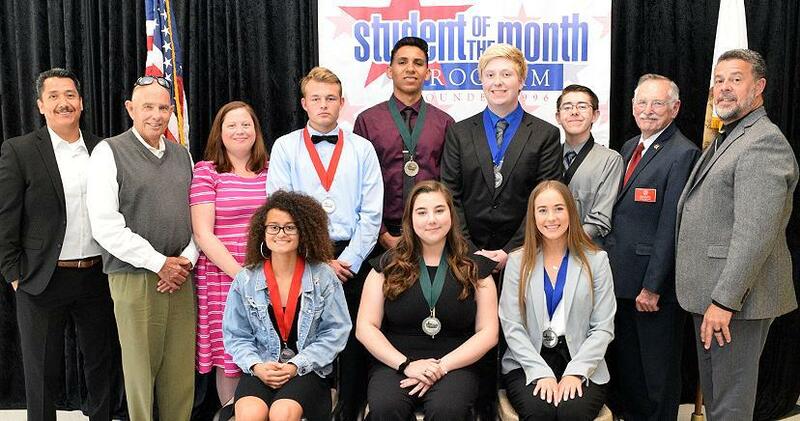 Student of the Month and Student of the Year events are recorded for airing over Spectrum Cable and FIOS TV. Below are video links to play or download from Vimeo. 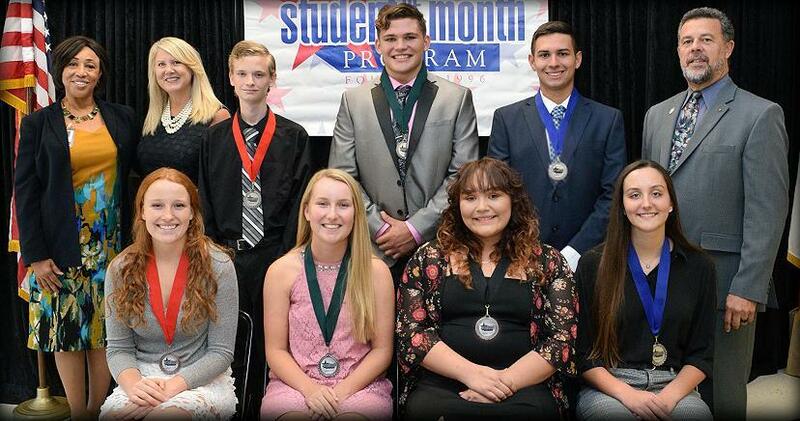 2018 STUDENT OF THE YEAR: Seated: James Black III—KMA; Daniel Lomboy—LHS; Taylor Ogden—LHS; Nathan Strong—TCHS; Micole Marietta—TCHS; Timothy Jakell—EHS; Sheryl Ghoubrial—EHS. Standing: Sally Myers, founder; Dr. Judy White, Riverside County Superintendent of Schools; Mayor Natasha Johnson, City of Lake Elsinore; Juan Saucedo, LEUSD Trustee; Mayor Vicki Warren, City of Canyon Lake; Heidi Matthies-Dodd, LEUSD Trustee; Kim Joseph Cousins, President/CEO, LEVCC. 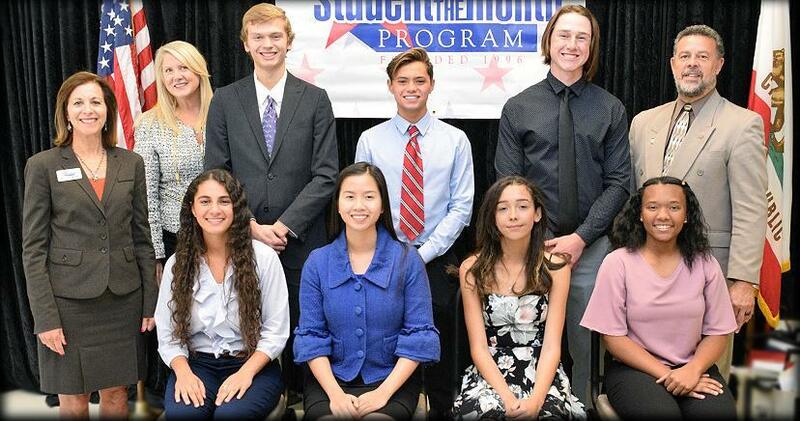 SEPTEMBER STUDENT OF THE MONTH: L-R seated: Kaylee Clarke—EHS; Natalie Smith—LHS; Gianna Santos—OHS; Kylie Tulley—TCHS; Back: Jacqueline Slavin-Newberry (RCOE); Heidi Matthies-Dodd (LEUSD Trustee); Isaac Coleman—EHS; Maguire Cole—LHS; Kaden Quintana—TCHS; Kim Joseph Cousins (LEVCC President/CEO). 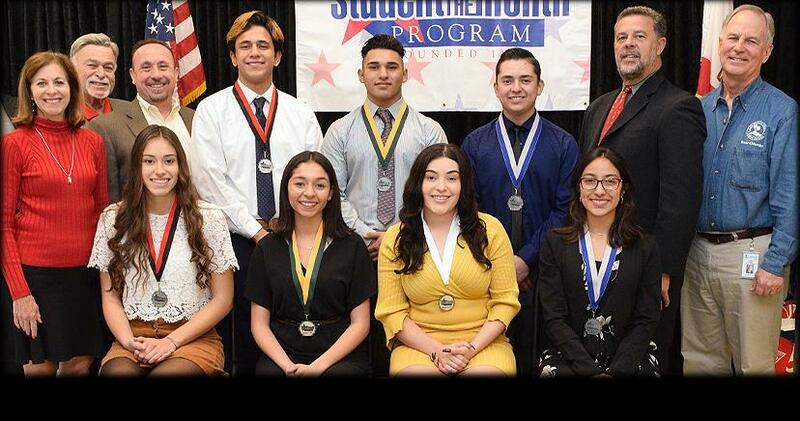 OCTOBER STUDENT OF THE MONTH: L-R seated: Annabelle Hernandez (EHS); Sofia Aguilar (LHS); Eithzy M. De La Cruz (KMA); Haley Snow (TCHS); Back: Dr. Kip Meyer (LEUSD); Cameron Ross (EHS); Brandon Butler (LHS); David Hernandez (TCHS); Kim Joseph Cousins (LEVCC President/CEO). NOVEMBER STUDENT OF THE MONTH: L-R seated: Charlyn Ghoubrial—EHS; Britney Nguyen—LHS; Mailei Rose—OHS; Ariel Nelson—TCHS. Back: Sally Myers, founder; Heidi Dodd—Trustee member; Tyler Leffler—EHS; Zachary Araneta—LHS; Campbell McGarvey—TCHS; Kim Joseph Cousins, CEO/President, LEVCC. DECEMBER STUDENT OF THE MONTH: L-R seated: Jazmin Daniela Lopez—EHS; Raelene Reyes—LHS; Taya Ortiz—KMA; Viviani Bojorquez—TCHS. 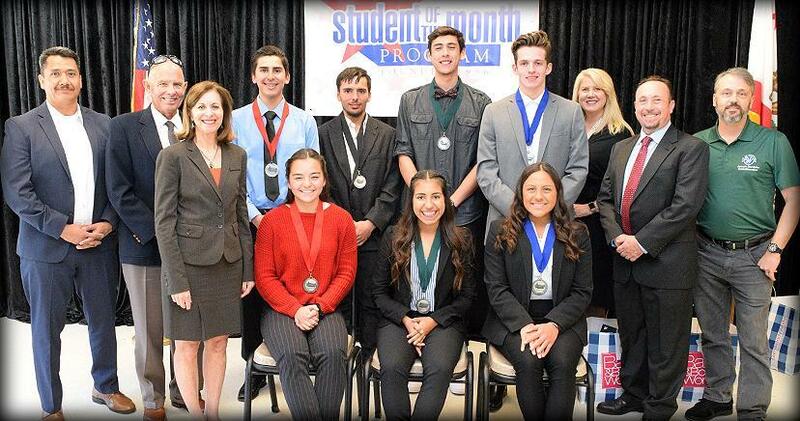 Back: Sally Myers, SOM founder; Jordan Ehrenkranz, City of Canyon Lake; Andy Morris—EVMWD; Jose Cardenas—EHS; Vicente Gastelum—LHS; Jacob Galindo—TCHS; Kim Joseph Cousins, CEO/President, LEVCC; Stan Crippen—LEUSD Board President. 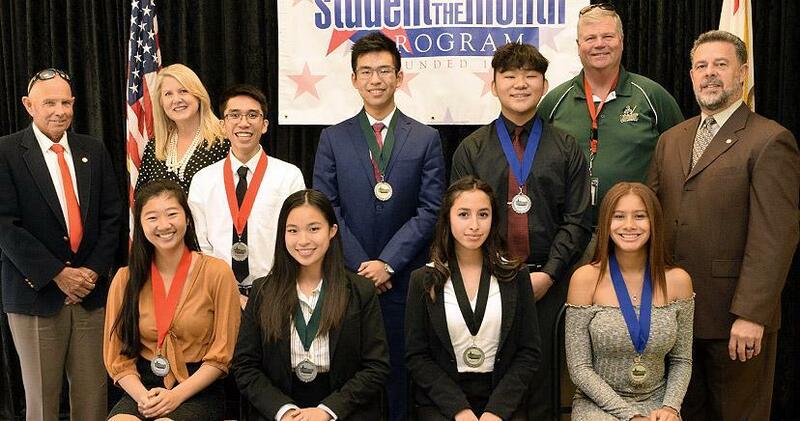 JANUARY STUDENT OF THE MONTH: L-R front: Amy Tran—EHS; Hillary Tran—LHS; Miranda Iniguez—OHS; Arianna Abdul—TCHS; Back: Mayor Larry Greene,City of Canyon Lake; Heidi Matthies Dodd, LEUSD Board Clerk; Brandon Fuentes—EHS; Chonghao Guo—LHS; Victor Li—TCHS; Superintendent Doug Kimberly, LEUSD; Kim Joseph Cousins, LEVCC President/CEO. FEBRUARY STUDENT OF THE MONTH: L-R front: Haley Anderson—EHS; Chelsea Salinas—LHS; Ashley Carlstrom—TCHS; not pictured: Crystal Rios—KMA. 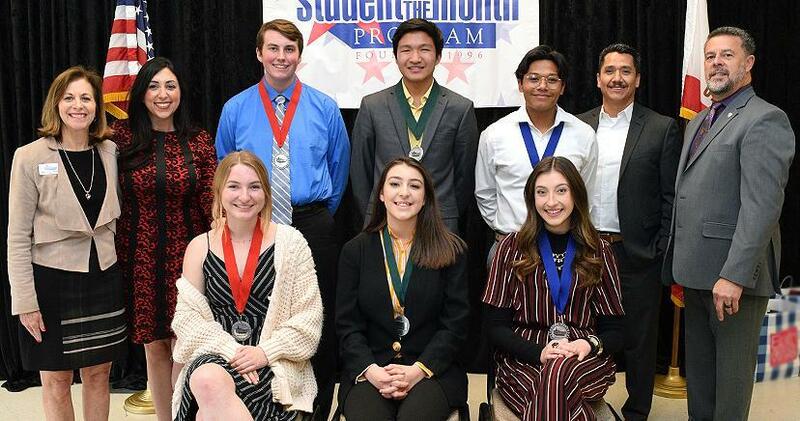 Standing: Sally Myers (program founder); Mayor Natasha Johnson, City of Lake Elsinore; Spencer Massicot—EHS; Ferdison Co—LHS; Nicolas Saucedo—TCHS; Juan Saucedo, LEUSD Trustee; Kim Joseph Cousins, LEVCC President/CEO. MARCH STUDENT OF THE MONTH: L-R front: Abigail Hotchkiss—EHS; Adrianna Serrato—LHS; Alejandra Hurtado—TCHS. 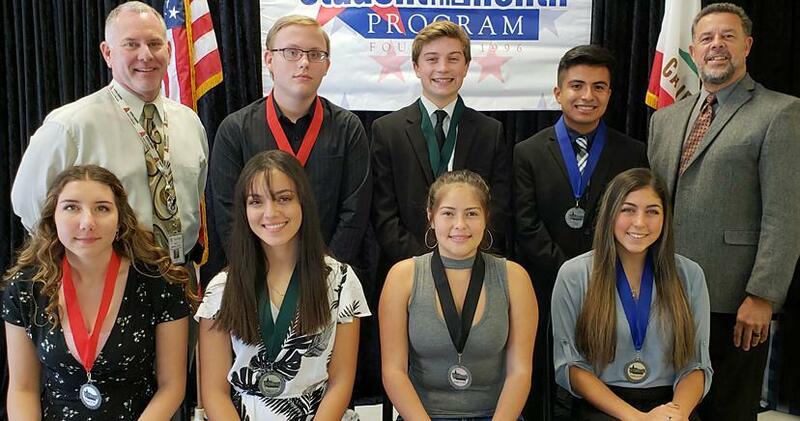 Standing: Juan Saucedo, LEUSD Trustee; Larry Greene—Mayor, City of Canyon Lake; Sally Myers—SOM Founder; Daniel Olazabal Silva—EHS; Austin Madeira—OHS; Sam Kizler—LHS; Dane Padrnos—TCHS; Heidi Matthies Dodd, LEUSD Trustee; Andy Morris—EVMWD Board Member; Joseph Morabito—City of Wildomar Council Member. 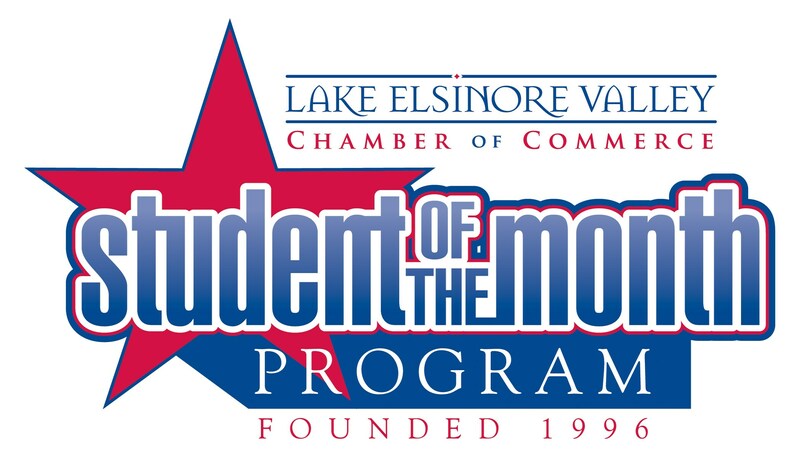 Outstanding LEUSD high school seniors are honored during the Student of the Month program, under the auspices of the Lake Elsinore Valley Chamber of Commerce and BMW Management, which owns and manages Sizzler restaurants. 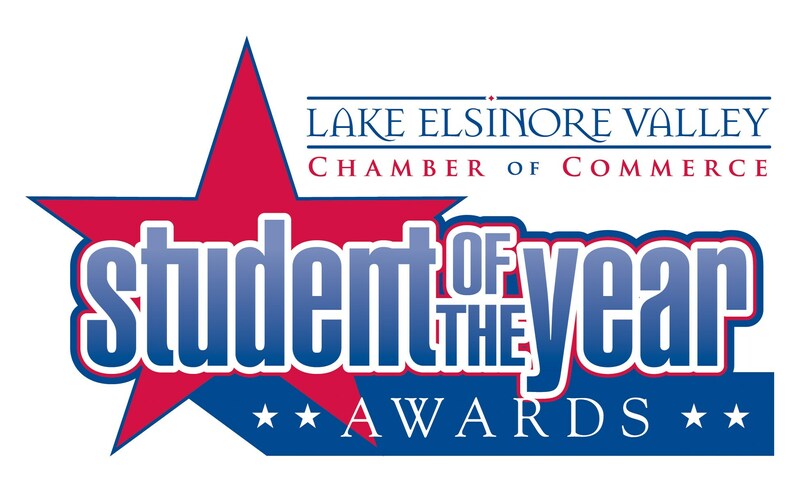 Students are individually nominated by teachers and selected for their character, love of learning, leadership, community service, and perseverance.